Are you getting your fair share of showings? You’ve had your house on the Spring Texas real estate market for 30 days now and in that time you’ve had only 1 showing. 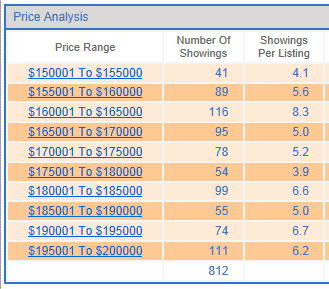 Are you getting your fair share of showings or is your competition averaging more showings than you? If your Spring Texas Realtor is utilizing the Centralized Showing Service to schedule your showings, then the answer you seek is within reach. Our showing service provides us with the ability to run numerous market reports. My favorite is the showing report. I can select a price range with $5,000 increments, a zip code, and a date range and see how many showings have been scheduled and the average showings per listing. No more guessing. The report shows you if your listing is getting its fair share of showings. To the right is the showing report from April 8, 2012 – May 8, 2012 for zip code 77379. Disclaimer: The number of showings does not include the showings on the listings that did not use the Centralized Showing Service to schedule the showing. But the majority of Realtors use the service so it does provide a good representations.